If you want to go bargain shopping Melbourne is famous for its direct factory outlets and whole streets dedicated to clearance warehouses. You can pick up daily deals and Melbourne specials, brands and labels at great discounts, for any style and wallet size. Whether you are after chocolates, clothing, leather goods, accessories, shoes or souvenirs, you do not have to pay full price if you know where to look. This is an established Melbourne discount shopping strip, well known by locals and visitors. Here retail stores have warehouses selling their shoes, clothing and accessories at clearance prices, mixed with many others great shops and cafés. Bridge Road, Richmond has atmosphere and is also a great place for lunch or coffee! You get there on the #48 and #75 trams from Flinders Street. This is where to go shopping Melbourne for sports, outdoor and leisure gear. You can get great bargains on brand running shoes, fashionable street and gym wear, as well as outdoor clothing. And mixed in with these are various fashion shops, where you may come across some other bargain. Factory outlets are between Johnston Street and Alexandra Parade. You get there with the #86 tram from the city. The Sydney Road shopping strip stretches from Brunswick Street right up into Coburg, in fact it is the longest continuous shopping strip in Melbourne, about 4.5km long. There is a string of discount shops and factory outlets along Sydney Road. However, they are not all in one area and you will need to hop on and off a tram to explore it all. This area has a great mix of ethnic, alternative and arty shops, and you will find wonderful multicultural supermarkets, cafes and pubs. Get there on the #19 tram from the city. 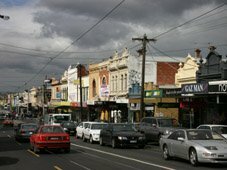 Along Lygon Street, Brunswick is another trendy area with more direct factory outlets of all sorts, fashion, bags, fabrics. You get there with the #1 or #8 trams. DFO, Direct Factory Outlets, are a great for cheap brand shopping in Melbourne. There are three outlets in Melbourne and each has around 100 factory outlet stores of most major brands, all at great discounts. There is a DFO at the new shopping complex in the South Wharf. You can get there from the Exhibition Centre tram stop (tram 96 or 112) and walk through or around the Exhibition Centre, and there is plenty of car parking as well. Another DFO is in Essendon next to the Tullarmarine Freeway, on the way to the airport, and another one in Moorabin. Brand Smart Factory Mall is another great factory clearance outlet with over 48 factory discount stores for fashion, accessories, home wares, kids clothing and food stores, including great names such as Jigsaw, Polo Ralph Lauren and Calvin Klein. It is at 286 Whitehorse Road, Nunawading. It is only a 200m walk up Springvale Road from Nunawading Station. High Street, which stretches through Northcote, Thornbury and Preston is another long shopping road with various factory outlets along the way. In the upper end of Northcote, you find discount groceries and electrical stores. Further up in Preston are great places for sports shoes, bedding and furniture. Preston Markets is also a great place for a discount on just about anything. Similarly, for more cheap shopping Melbourne has many weekly markets where you will get great discount clothes, leather and goods. There are the South Melbourne Market, Queen Victoria markets and Prahran markets. There is a Melbourne Outlet Shopping Tour that takes you around the Melbourne factory outlets and Melbourne's best discounts and hard-to-find warehouse sales. A perfect tour for a first time bargain shopper in Melbourne. You will be taken to great spots you would not necessarily find yourself. It includes good company and lunch. The Melbourne Market and Outlet Mall Shopping Tour, on the other hand, focues on the bargains you can find at Queen Victoria Market, Harbour Town and the DFO. It would be of interest to any newcomer to Melbourne who is after a quick bargain without having to find these places on their own. With all those options for discount shopping Melbourne, why ever pay full price again? And here a tip for those who want to get the best daily deals and shopping Melbourne discounts: Each season, the Official Visitor Guide to Melbourne gets published by the tourist office. It is a small booklet with the attractions and events for that season. In the middle of this, you get a double page of Melbourne coupons, which give you discounts to various tourist attractions, as well as discounts at a variety of shops and restaurants. You can pick up this guide in the visitors centre and, most of the time, also in the free city circle tram. Do you have any favourite factory outlets - Melbourne bargain shopping tips? Why not share them! Enter the Title of Your Bargain Shopping Tip. If you have any photos to add, click the button and find the first one on your computer. Select it and click on the button to choose it (maximum size 800x600 pixels). Click on the links below to see some great Melbourne bargain shopping tips. They were all written by other visitors to this page.